Sen. Patrick Leahy (D-Vt.) on Monday accused President Donald Trump's administration of seeking to intimidate Special Counsel Robert Mueller by firing former Federal Bureau of Investigation deputy director Andrew McCabe. 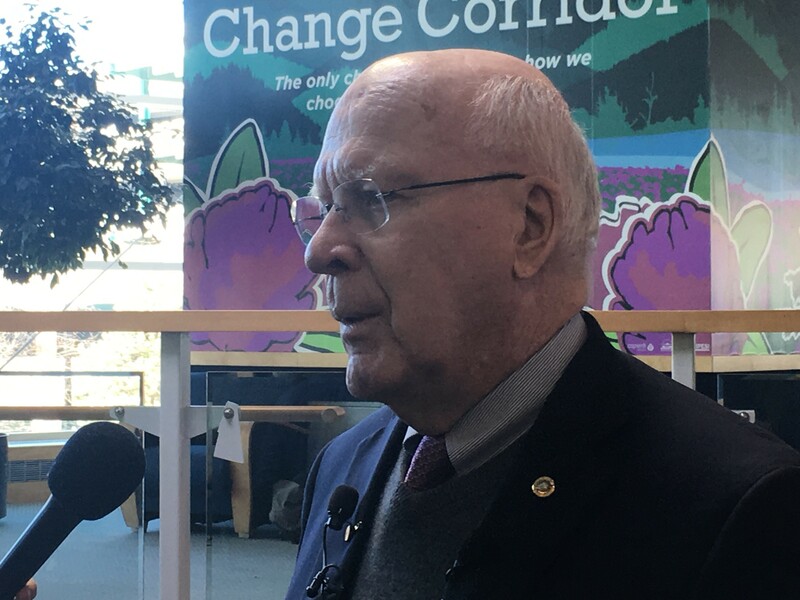 "This is just trying to intimidate the people in the Department of Justice and the FBI," Leahy said during a press conference at Burlington International Airport. "I don't think Bob Mueller will be intimidated by anybody." Speaking two days after McCabe's dismissal, the senior member of the U.S. Senate Judiciary Committee also said that he was "concerned about the attacks now ramping up on" Mueller, comparing the situation to Watergate. For the first time this weekend, Trump directly criticized Mueller's investigation of Russian meddling in the 2016 presidential campaign, alleging that members of the special counsel's team were "hardened Democrats" and supporters of Democratic nominee Hillary Clinton. The day before, Trump lawyer John Dowd called on Deputy Attorney General Rod Rosenstein to shutter the Mueller investigation. Asked if the special counsel's firing would provoke a constitutional crisis, Leahy said, "I think so." But the senator would not say how he would respond to such an eventuality. "You'll see that if [Trump] does attempt to fire him, I'll make some very strong stands on that," Leahy said. Leahy also declined to say whether he believed the president had committed impeachable offenses, saying he was "waiting to see all the evidence that comes in." Asked whether the firing of former FBI director James Comey constituted grounds for impeachment, Leahy said, "I think that comes close." Calling Russia's alleged attempts to manipulate American elections "a huge threat," Leahy said, "The president finds it very, very difficult to say anything that appears to be critical of Russia." On Saturday, following Attorney General Jeff Sessions' dismissal of McCabe, Leahy publicly released a January 30 letter to Sen. Chuck Grassley (R-Iowa), who chairs the Judiciary Committee, calling on the panel to hold oversight hearings on "the escalating attacks on, and risk of politicization of, the FBI. "History will judge us harshly if we collectively shrug our shoulders while our nation's premier law enforcement institutions are under assault," he wrote, adding in his own handwriting, "Chuck — it is serious." Grassley has not scheduled such a hearing, but according to Leahy, "They're looking at it." During Monday's press conference, Leahy also appeared to criticize Trump for the five draft deferments he received during the Vietnam War. "I have respect for Bob Mueller," the senator said. "He's a decorated Marine, not a draft dodger."